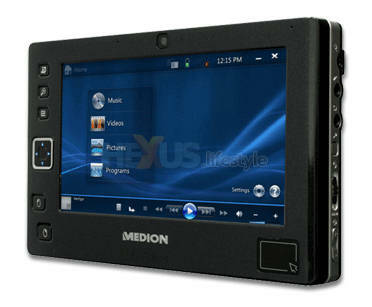 High-quality-PC box-shifter Medion is readying to launch in the UK an ultra-mobile PC (UMPC) - the MD96211 - running Windows Vista Home Premium and priced at £799 (inc VAT). That looks pretty appealing until you realise that the same model will go out in Medion's home market, Germany, for a rather keener €999 (equivalent to £678) and in the USA for just $999 - the equivalent of £588 even after adding VAT at 17.5% to the $ > £ conversion figure of £500. 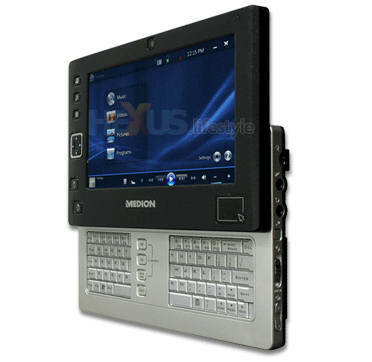 Specs look much the same where ever you buy and are headlined by a 6.5in, 800x480 backlit touchscreen TFF display; a 1.0GHz VIA processor, the C7-M 770 ULV, with 400MHz FSB; 768MB of DDRII RAM; a 30GByte hard disk; and graphics from a VIA UniChrome Pro II GFX. The unit weighs in at 740g including batteries and measures just 190(w) x 121(d) x 28.3(h) mm when closed. Wireless networking (802.11b/g) and Bluetooth 2.0 are both built in, as are a webcam and microphone and a basic card-reader able to handle SD, SD-IO and MMC. The big question, though, is whether this might be too little, too late. Significant changes are afoot in the UMPC world, as shown by a report we filed from the Intel Developers Conference in Beijing, New Ultra-Mobile PC form factor is squashed Centrino. Thoughts on UMPC and this latest example of rip-off Britain? Be keen to hear 'em in the HEXUS.community.